If anything demonstrates how our senses provide us with a useful abstraction of the world, rather than a photographic image, it is surely the various 3D technologies now proliferating. The sensation of 3D is a weird thing. At some engine-room level in our brains, 3D things just look like they are in three dimensions. It is a workable model, a construct. This construct in our brain makes it clear that these parts are closer and those parts are further away, and that is the whole point of it. But there are several different ways in which this constructed sense is triggered. the most obvious is by providing each eye a different view of the picture. That’s what most 3D technologies do. In the real world, this sense only works with objects within metres, tops, of the viewer, because the angle difference between your two eyes is too small for further distances. But that doesn’t stop the technique being employed in 3D cinema and TV to make much greater distances seem 3D. That little subroutine in the back-office computer room in the brain — the one with the sign ‘Video Processing’ on the door — apparently doesn’t care that your left eye and right eye are seeing that an object fifty metres away is in a different position with respect to its far background. It just notes that they are seeing these different views and invokes that ‘3D’ sense. Now both eyes are seeing the same view at all times, yet it looks 3D. Here is another thing that triggers this 3D sense: objects moving in front of other objects in a way that makes them look closer. Here is another example of that. 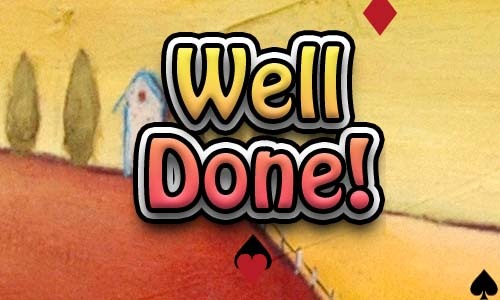 On my iPad I have a Solitaire game that finishes — when you win — with an inane congratulatory message. It bounces up a down a little. Meanwhile, little hearts and clubs and spades and diamonds ascend from the bottom of the screen passing underneath it as they go upwards at various speeds. Sometimes this looks startlingly 3D. In this case, I think the trigger for the 3D process is the movement of sharp foreground objects over a slightly out-of-focus background, which is what you often experience outdoors. Your eyes are focused on something ten metres away and it is moving with respect to the background, which is a touch soft because you aren’t focused on it. This entry was posted in 3D, Imperfect perception. Bookmark the permalink.